On Thursday, students, faculty and staff are invited to stop by 10 EmoryThanks locations, including the main event at Asbury Circle, to write notes and take photos and videos thanking donors for their support. The first EmoryThanks day, an opportunity for the campus community to thank Emory donors, will be Thursday, Nov. 17. Participants are invited to stop by any of 10 stations, including one on the Oxford College campus, to write a note and take photos or videos thanking Emory donors for their gifts that help students and contribute to Emory’s quality of life. The main event will be from 10 a.m. to 2 p.m. at Asbury Circle. Schools and units will hold additional thank-you events, including the libraries and Campus Life. These expressions of gratitude will be shared on social media at #EmoryThanks, utilizing Twitter, Facebook and Instagram. Treats will be provided and everyone who posts will be entered to win one of four $50 Amazon gift cards or a Bluetooth speaker. 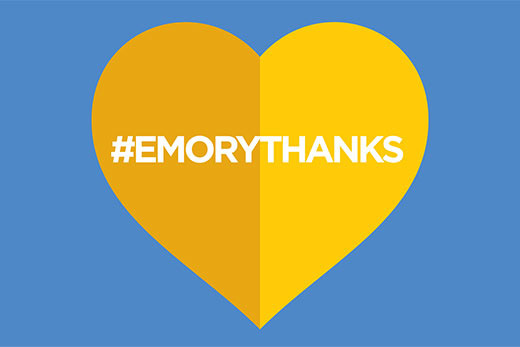 Schools, units and organizations are encouraged to re-post on their own accounts using #EmoryThanks. The EmoryThanks Facebook and Instagram pages will be re-posting throughout the day. Emory Donor Relations, which is spearheading this university-wide event, will create a post-event video and photo compilation that schools, units and organizations can share on social media. More than 35,000 supporters gave gifts or made commitments in 2015. More than $199 million was raised to support transformational innovations for health issues in the 2015-2015 academic year. Donors helped established 13 new endowed chair, professorship and lectureship positions and over $205 million was given to support faculty and academic programs in the 2014-2015 academic year. Forty-five new scholarships for students were established through donors’ gifts in 2014-2015. 94 percent of annual gifts to Emory last year were under $1,000, providing a total of $4.97 million. Last year, 69 percent of Emory students received financial aid. For questions or more information regarding EmoryThanks, contact Megan Jones, events manager, Donor Relations, 404-712-4742, megan.jones@emory.edu.